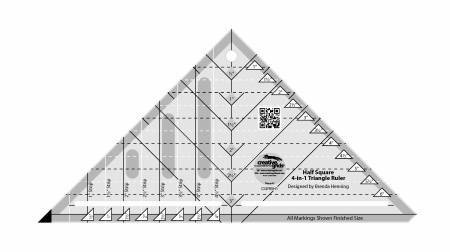 Create half-square triangles (HST) in multiple sizes using the same tool. Whichever technique is used in the pattern you choose can be completed with this ruler. Instructions show four different ways to sew HST's. Method #1 - Create eight half-square triangles out of a set of squares. Method #2 - Cut ready to sew sets of triangles from strips. Method #3 - Mark and Sew 1/4" seam lines. Method #4 - Trim Over-sized HST's to the correct size. Choose the method that works best for you.